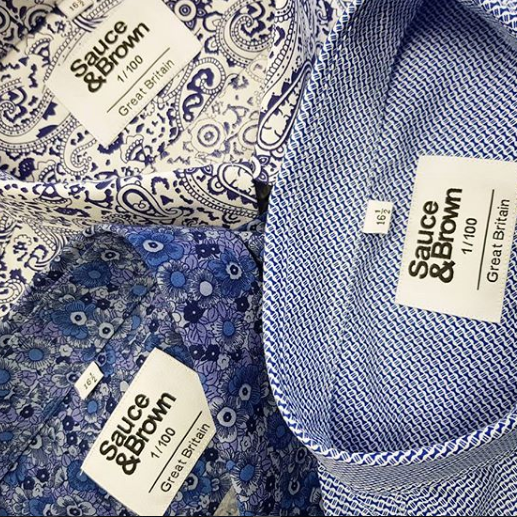 With years of high street retail experience behind them the founders of boutique menswear brand Sauce and Brown were perfectly placed to set up their own unique label. Anthony Wallis and Andrew Frogson were bored with the offerings of the mass market, they saw a niche for affordable, sustainable, limited edition clothing that offered an exclusive purchase, at an affordable price. What started as an idea in 2012, and with an investment of just 5K is now an established menswear brand with a loyal clientele. Production is limited to just 100 of each item, and each garment is hand crafted to perfection. The brand offers individuality, and importantly sustainable fashion. Collectable menswear that offers a subtle protest against throw away fashion. As an example of customised manufacture Sauce and Brown are making headway, pioneering a new marketplace for creative retailing. Utilising Digital Print to manufacture short runs, they break the boundaries of commercial retail and offer a refreshing alternative to Fast Fashion. What inspired you to create your brand? We created S&B because nobody was offering limited edition, affordable menswear. You have a loyal fan base, how do you reach them? Reaching out to engage in a different way via social media and email has been very successful. Connecting with our incredibly loyal clients to bring them a unique retail experience is at the heart of our business. What's the biggest challenge in manufacturing? It's still cashflow, we have no issue finding manufacturers that understand what we need. How important is Digital technology to your business? Digital printing is perfect for us, and its been a vital component to our business model. With no minimum runs or extortionate set up costs we can buy exactly what we need, when we need it. Is sustainability an affordable option for the bespoke brand? We think so, wherever possible we look for a sustainable option in all our product ranges and suppliers.